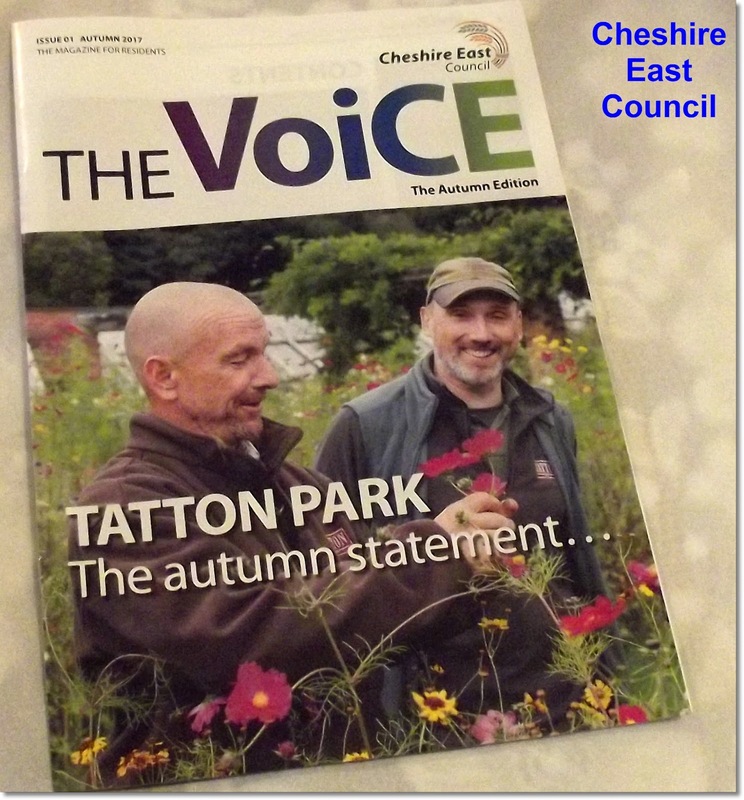 THE MIDDLEWICH DIARY: 'THE VOICE' ISSUE ONE, AUTUMN 2017(EDITORIAL). We feel that it's only right that this review of Cheshire East's new initiative - The Voice - should come under the heading of an 'Editorial'. It's something we very seldom do. In fact there has only ever been one Diary Editorial before this, and that was on the vexed question of the bypass. It was deleted soon after publication and now exists only as a file, somewhere in our archives. But please bear in mind that the views expressed in this Diary entry are solely those of the editor. First of all, it has to be said that there's a lot that's worthwhile in The Voice (issue number one, Autumn 2017, out now). Those of us who are beyond the first flush of youth will be interested in the article about the council's 'care and repair' service (page 8) which can take a lot of the hassle out of arranging household modifications such as new central heating systems, new bathrooms and kitchens and all the other things we all need to keep us safe and independent as we grow older. There are articles about Fostering (page 12) and Adoption (page 13), getting a flu jab (page 18) and 'News Bulletin' (page 4) has a round-up of good news stories about the Borough. 'Families Matter' (page 10) brings us up to date on the services provided by the Council's children's and family centres which provide support to families throughout Cheshire East. And there's an interesting piece about the dramatic re-construction of the trial of Alan Turing at the Courthouse Hotel in Knutsford - the very place where the original trial took place 65 years earlier when the hotel was Knutsford's courthouse (page 11). I'm sure that those of us here in Middlewich are happy to know about all these things and these pages are, perhaps, something of an antidote to the relentless negative publicity which Cheshire East, some might say with good reason, receives. It is, unfortunately, when we start to peruse the other pages - the pages where our Borough Council attempts to 'blow its own trumpet' and tell us of achievements in various part of Cheshire East, that the wheels fall off. I draw your attention to page 6 of The Voice and two-page spread simply entitled 'Regeneration Plans'. Here we learn that 'There's no place like Macclesfield'. They're right, of course. Macclesfield is lovely, and often under- appreciated. And - good news folks! - it's going to get even lovelier with £30m of commercial investment going into the town, along with £1.4m of 'public realm' investment by Cheshire East. What it's all about, the magazine explains, in as horrible a piece of council-speak as you'll find anywhere, is to 'boost the existing town centre offer'. Hurrah! Down the road apiece, in sunny Crewe, we can look forward to 'a town centre to be proud of'. Just £48.3m to you, guvnor! Well worth it, of course, and looking to the future, when Crewe becomes part of the HS2 network, worth every penny. And it's all on top of the £25m already 'invested'. It naturally follows, at least CE thinks it does, that where the council sprinkles its 'seed money', private investors eagerly follow! Hurrah again! In Congleton things are slightly more low-key, with only £1m of public realm investment aimed at...well, just making the town look nicer, really. We all want our town to look nicer, don't we? Isn't it great that we have a Borough Council that also wants to make our towns look nicer? Good old Congleton! Hurrah! You needn't think, though, that the Ancient Royal Borough of Middlewich isn't mentioned at all in this new magazine. We're right there on page 15 as part of an article called 'Crafting A Cleaner Borough', which is mostly about people picking up litter in Crewe (the Crewe 'Clean Team', you might say). Middlewich: Croxton Lane, Middlewich, CW10 9EZ. Tel: 01606 837128. So Cheshire East does think about us! Think rubbish - think Middlewich! That's the Cheshire East way! Next, if you have your own copy of The Voice to hand, you might like to turn to page 16 where we find an article called, 'Flying The Green Flag'. We know, we know! Although this article is really about the splendours of Tatton Park and the now refurbished Victorian Queen's Park in Crewe, we can't help feeling they've missed a trick by not including the magnificent Fountain Fields in Middlewich. The glory of Fountain Fields in Autumn. This magnificent floral display at Fountain Fields is just one of the ways in which Cheshire East Council enhances our lives. ...and so on to the 'What's On' section of The Voice. Since the Middlewich Diary started in 2011, we've become used to the idea that there are so many events happening in the town that it's difficult to keep up with them and almost impossible to list them all. The What's On section of The Voice redresses the balance somewhat by listing just one Middlewich event between now and Christmas. Are we being unfair? Of course we are! This is, after all, the first edition of The Voice and we can hardly expect everyone to get a look in. You'll have noticed that Middlewich is not the only town to receive what looks like short shrift from the editorial team. Sandbach, for example, doesn't seem to get much of a look in (though their Christmas Market is featured in 'What's On'). Nor, strangely, does Nantwich (except, again, in the What's On' section). No doubt whatever the equivalents may be of the Middlewich Diary in those towns will also be sitting up and taking notice. As our name implies, we can only speak for this town. And these are early days. We look forward to future editions of The Voice in which Cheshire East tells us how many millions they intend to spend to make our town look lovelier and boost our 'town centre offer'. They might even spend a bit of money to make Fountain Fields even more gorgeous than it is now! Brilliant! And the photo makes me wish to rush for your obvious Middlewich delights! No mention of Knutsford though.. pity.. no-one mentions Knutsford.. Not Cheshire East Council. Not the NHS. No-one. Still.. I live in the unrecognised black hole in between the whole mess, fortunately in Cheshire West.. Now, if I could just move the motorway crashes and queues a bit furtheraway..